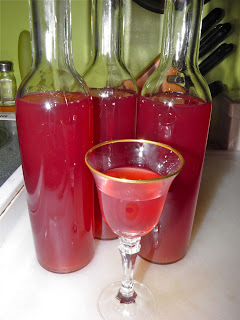 I am posting two different recipes to make this wondrous elixir. 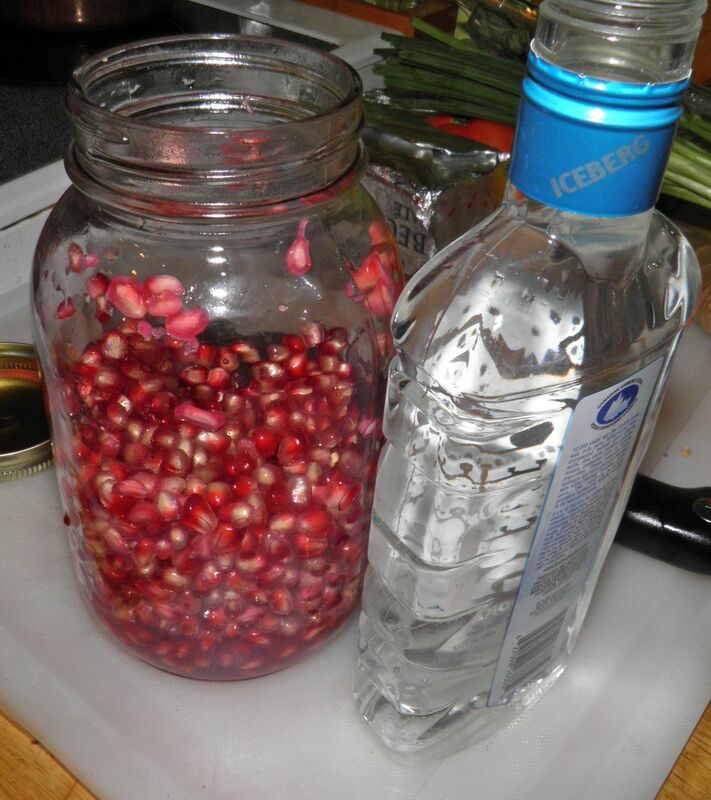 One starts with pomegranates, the other cheats a bit and uses POM® pomegranate juice from concentrate. Both work well and give a great end result. Pomegranates are just now starting to appear in the grocery stores at what can be considered affordable prices. 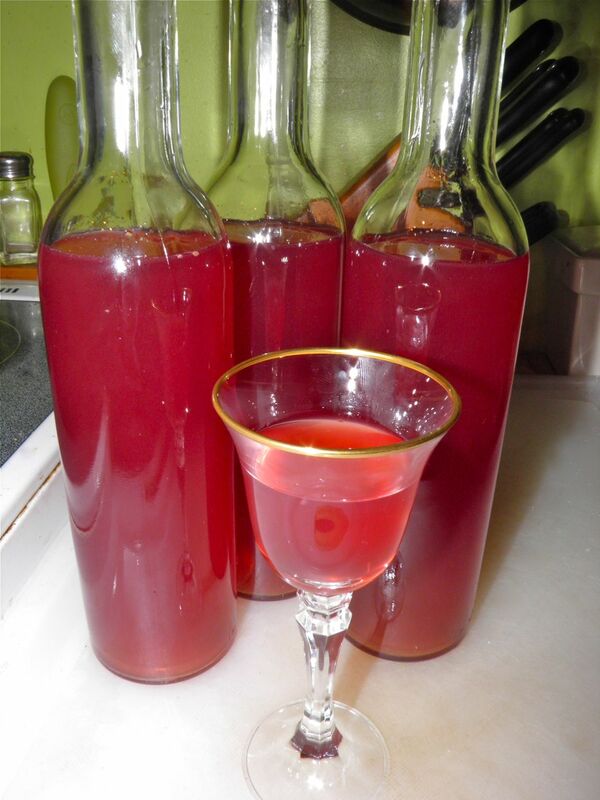 I started my liqueur about 3 weeks ago when the first fruits appeared. They weren’t the ripest, so I actually ended up “boosting” my pomegranate flavour by adding a little POM®. Be your own judge on that. My pomegranates weren’t as ruby red as I would have preferred. If yours are, then you can forgo the POM®. Or forgo pomegranates all together and just use the concentrate. I hope you try one of these recipes. The fruit infusion takes three weeks of aging. Using POM® is about a 1/2 hour maximum adventure. To make a stronger liqueur, cut back on the sugar and water used for the syrup to 1 cup each. Of course your final yield of liqueur will be less by 1 cup. A note about the vodka volume: Canada uses the metric system so our liquor is sold in 375 ml or 750 ml. These are smaller volumes than 1 pint or 1 quart. 375 ml is 1.5 cups, so if you use the pint (2 cups) your liqueur will be a little stronger in alcohol content. Is that really a bad thing? 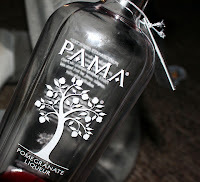 You can also increase the vodka on purpose to 2 cups to make it closer to the 17% of the PAMA® liqueur. can be a messy job. Makes 3 x 375 ml (quantity may vary); about 13% alc. vol. 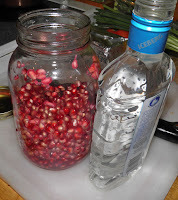 Remove all the individual red “seeds” from inside the pomegranates. Discard the peel and white membrane. Place the fruit in a 1 L Mason jar. Break up the seeds somewhat. Don’t worry if you don’t get them all broken. Pour in the vodka, shake well and seal tightly. Let the fruit age in the vodka for 3 weeks, shaking periodically. so I boosted the syrup with a little POM®. At the end of the time, strain the liquid through a cloth lines sieve to get out as much sediment as possible. 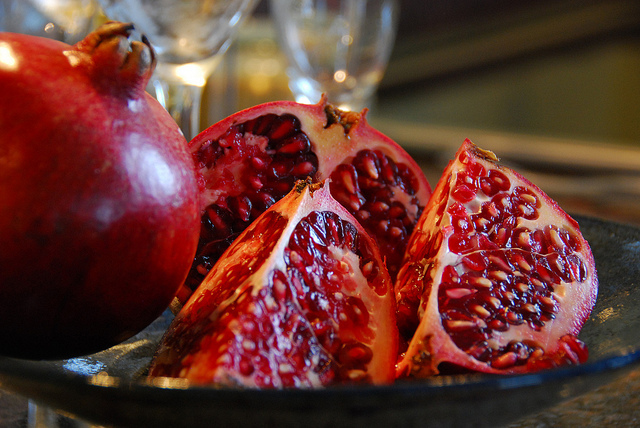 Wash your hands thoroughly and squeeze the pomegranate seeds with your hands to extract the juice. You should have close to 3 cups of juice. Bring the water and sugar to a boil and let simmer for 5 minutes. Allow the syrup to cool before adding the infused vodka. Pour into bottles and enjoy. 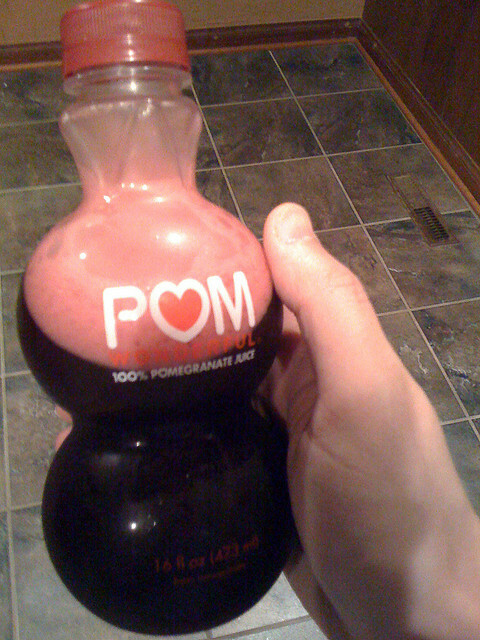 When purchasing the POM® make sure you only get the pomegranate juice unless you intend differently. POM® also sells six blends with additional flavours like blueberry, cherry, mango, etc. 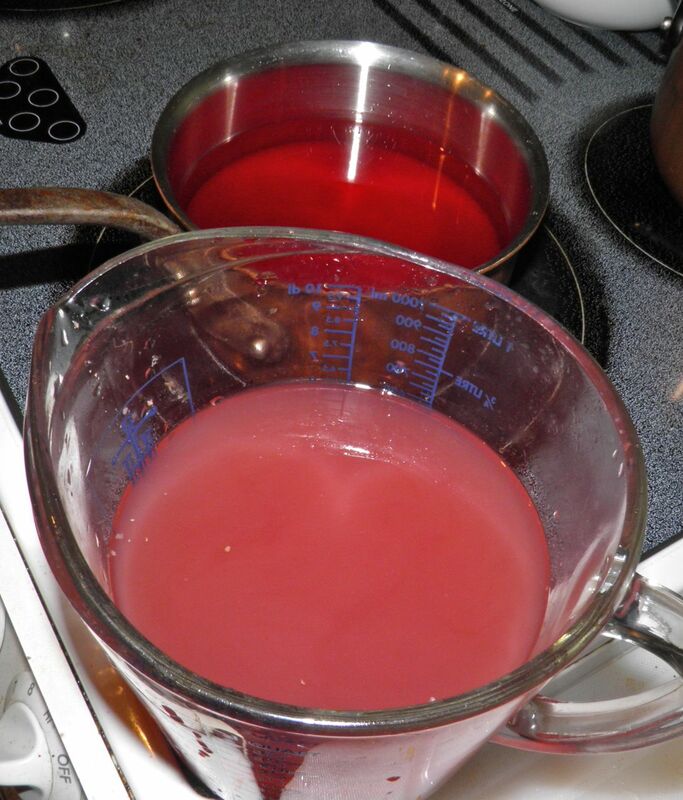 Place the juice, water and sugar in a large saucepan. Bring to a boil and let simmer for 5 minutes. Allow the syrup to cool. Pour in the vodka and stir to combine. Pour into bottles and let age for 1 week (or longer) before drinking. The end result from Recipe 1. 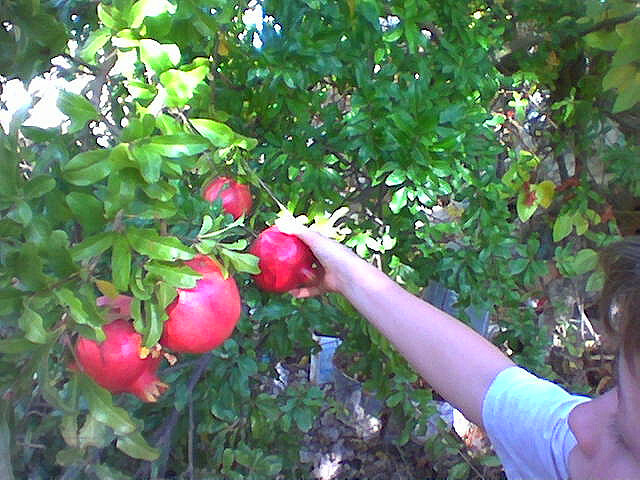 Wouldn't it be wonderful to go out back and pick pomegranates fresh from the tree?